The US Federation of Worker Cooperatives and the Democracy at Work Institute invites you to participate in our annual census to study the economic and social benefits of worker cooperatives. This is an opportunity to contribute to a major, ongoing research that will not only help shape the future for worker cooperatives in the US, it will also help us to show off just the strong, meaningful, and rapid growth of our sector. When we know more about how our individual workplaces compare to each other and to traditional firms, it allows us share our successes and support each other. You’ll be able to see how your cooperative experience compares to other worker cooperatives and traditional firms, and each participant will receive a digital copy of the report. Knowledge and public awareness about worker cooperatives will grow. We are at a crucial time where people are beginning to look for real, workable solutions — this census allows us to share our movement with the wider world. It will be easier to gain policy support. Hard numbers will help us to increase policy support, funding and technical assistance resources for worker cooperatives across the country. Huge savings on membership to the U.S. Federation of Worker Cooperatives. 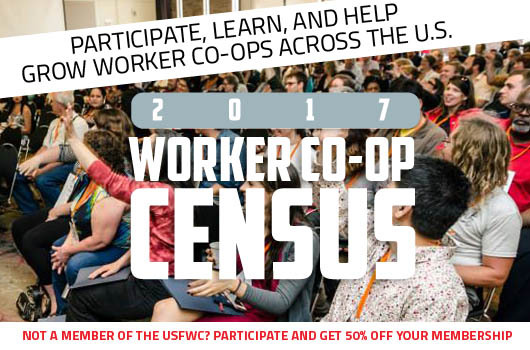 For worker cooperatives that are not yet members of the USFWC,, we are offering 50% off of your membership dues through June 2018 upon completion of this survey. Membership gives you access to vital benefits like access dental coverage, referrals, peer networking, and *starting next year* access to vision insurance coverage.